There are some amazing things you can do with photographs, but this article will talk about something that you probably have never heard about. I have been involved with the art of etching glass for a number of years now and nature was always of interest to me. So I want to explain a little about permanently etching nature photographs into a piece of glass. This is sometimes called photo etching. 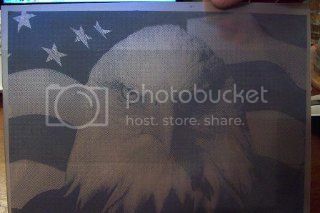 Below I will show you the process I took to etch this eagle photo onto a piece of glass. 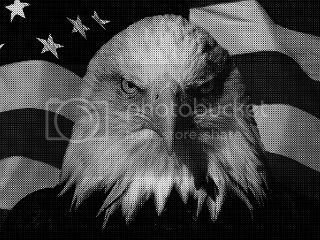 The first step was to obviously find a high quality photo and I picked this one featuring an eagle with an American flag behind it. Of course, this has to be a digital photo. For the second step, you have to make a stencil out of this photo. The only way to do that is to use the photo sensitive material called a photoresist. This works by exposing UV light onto the photoresist through a black and white pattern. Rather than going into too much detail about how this process works, you can read more about photoresist here. Before you expose the photoresist, you have to make the pattern into the correct form. To do this, I used Photoshop. I changed the color photo into a grayscale image and made it what we call a halftone. This basically creates very small black dots that make up the image. It is hard to notice them, but when you zoom up you will see them. The image below is what it looks like on the screen. For step three, you have to print this halftone onto a transparent sheet and then expose it onto the photoresist with UV light. The light will go through the clear areas of the transparent sheet and harden them on the photoreist. 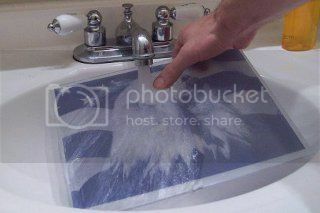 Step 4, you just need to apply the photoreist onto the glass and etch it. You have to use a sandblaster to do this. 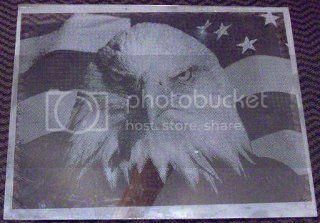 The picture below shows what the stencil on the glass looks like after it has been sandblasted. Step 5: Now you have to clean off the photoresist stencil. You can use warm water and a razor blade to remove it quickly. Step 6: That is about all it takes to do this. Just let it dry and observe the photo of the etched photograph below. This process seems hard to do but it’s actually very easy. If anyone has a question about this, please leave a comment. I'd be happy to help. Thanks! Join in and write your own page! It's easy to do. How? Simply click here to return to Photo-Artist-Showcase.